Arrival in Havana. Welcome to the 50's. Night at hotel Sevilla. Also included: airport to hotel transfer & welcoming by Cubaism rep.
Not included: flight to Cuba, Please contact jessica@cubaism.com for the latest prices from London. Our recommended/compatible outbound UK flight is the Virgin Atlantic VS063 on 2014-10-02. 5:30 pm - Arrive to Hotel Sevilla. The Cubaism welcome cocktail. 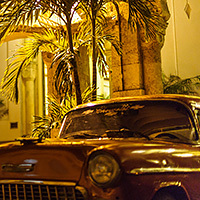 8:30 pm - Welcome dinner at the top floor Internation Restaurant where you will encounter our photography exhibition of the 50s in Cuba. Cigars, Old Havana & Tropicana. Night at hotel Sevilla. Also included: City tour, Tropicana Cabaret, Cubaism support rep all day. Â Discover the secrets of an ancient tradition in the land of the worldâ€™s best tobacco. Visit a cigar factory, smokerâ€™s museum & cigar shop. Includes meeting the house roller. Â Our recommendation for lunch is the Cuban Restaurant Los Mercaderes. To be paid locally. Â Afternoon to explore or relax, as you like. Â Our recommendation for dinner is at the Asturian Association Restaurant in Prado street, near from Hotel Sevilla. 09:00 pm Tropicana Cabaret - The original Cuban exotic paradise, under the stars with transfer included. Â The best real Cuban folk music & dance show in the world. Â Included: 1/4 bottle of rum + 1 coke. Havana Club Rum & Convertibles cars. Night at hotel Sevilla . Also included:City tour, Classic Convertible Car tour, Cubaism support rep all day. Â Visit to the Rum Museum. Tasting the Havana Club Rum & lessons in cocktail-making. Top barmanâ€™s secrets included. Â Tour of the most famous bars of the old town: the Floridita*, Bodeguita del Medio* & Ambos Mundos* roof top. One cocktail included in the latter. Â Our recommendation for lunch is the Cuban Restaurant DoÃ±a Eutimia at Plaza de la Catedral. To be paid locally. Â Afterwards you can have a couple of hours to explore or relax, as you like. Then the following program is guided but the food and drinks are not included. 04:00 pm El Capitolio - Classic Convertible Car tour with one stop for a real PiÃ±a Colada at El Morro*, to be paid locally. 05:00 pm La Piragua - Amigos de Fangio* classic car event. 06:00 pm Nacional Hotel patio cocktails & cigar bar, to be paid locally. 09:30 pm El Litoral restaurant, to be paid locally. 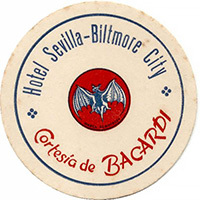 *Floridita: Where Ernest Hemingway (Nobel Prize-Winning American writer) spend so many hours with his favorite drink, Daiquiri. *Bodeguita del Medio: It is a typical restaurant-bar of Havana (Cuba). It is a famous tourist destination because of the personalities which have patronized it: Salvador Allende, the poet Pablo Neruda and the writer Ernest Hemingway. La Bodeguita lays claim to being the birthplace of the Mojito cocktail, prepared in the bar since its opening in 1942. *Hotel Ambos Mundos: A Hotel of square form with five floors, built with an eclectic set of characteristics of 20th-century style architecture. 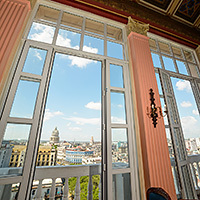 In 1932 a room on the upper (5th) floor became the â€œfirst homeâ€� in Cuba of writer Ernest Hemingway, who enjoyed the views of Old Havana, and the harbor sea in which he fished frequently in his yacht Pilar. *El Morro: Is a picturesque fortress guarding the entrance to Havana bay. Was built in 1589, Cuba was under the control of Spain. *Amigos de Fangio: A nonprofit association that tries to join together all enthusiasts of the classic and vintage cars and motorcycles in Cuba. Big Event "El dÃ­a del Chevrolet 57". Night at hotel Sevilla. Also included: Cubaism support rep all day. 09:30 am El dÃ­a del Chevrolet 57, in front of hotel Sevilla. Â Join with the â€œA Lo Cubanoâ€� club car enthusiasts & their classic automobiles; to witness the first ever coming together of hopefully a rather substantial collection of 1957 Chevrolets; take part in the big car line up photo shoot & enjoy 50â€™s music from our live band. 10:00 am Cuban no.1 Celebrity photographer will announce the winner of the Cubaism Chevy 57 Photo Competition (on Facebook) & will introduce the new photo competition which start immediately & finish at 2:00 pm. Â Driving water test for Chevys 57. Â Chevys 57 & Hotel Sevilla quiz open to everybody. 01:00 pm Pizzas, burgers & sandwich lunch. 02:00 pm Continuation of A Lo Cubano. Finishes at 04.00pm. 09:30 pm On the top floor bar, we will do a presentation with the best ten pictures of the Photography contest & we will announce the winner. ViÃ±ales, natural & beautiful. Night at hotel Los Jazmines. Also included: ViÃ±ales guided tour, transfer & Cubaism support rep all day. 09:00 am Journey by bus (184 Km - 2.5 hours) to ViÃ±ales, to arrive at one of Cubaâ€™s greatest natural attractions, was declared a National Natural Monument for its remarkable landscapes. Visit the tobacco plantations & El Mural de la Prehistoria*. 01:00 pm Traditional Cuban Lunch at Mural Restaurant, with one drink included. 03:00 pm Visit & Tour by boat through the Indian Cave. 04:00 pm Check in at hotel Los Jazmines. 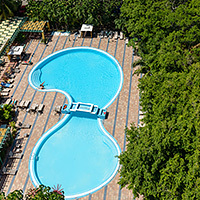 Opportunity to cool off in Cubaâ€™s most spectacularly located swimming pool. *Mural de la Prehistoria: This mural was painted on the slope of the â€œmogoteâ€� known as â€œDos Hermanasâ€�, is one of the world biggest outdoor natural paintings - 120 meters high and 180 meters wide. This mural, that took 5 year to complete by 5 artists, is a singular representation of the evolution theory. Jeep Safari. Night at hotel Los Jazmines. Also included: Jeep Safari & Cubaism support rep all day. 09:00 am Depart from H. Los Jazmines by jeep to â€œEl Moncadaâ€� community, one of the first founded after the Cuban Revolution triumph. Stop there to see â€œSanto Tomasâ€� cave, one of the biggest in Latin America. Continue the trip and arrive at â€œLa Loma del Vientoâ€�, where you can enjoy the panoramic view of â€œMinas de Matahambre - Cayo Jutiasâ€�. Meeting with local people. Tour around the village where you will see typical buildings associated with the mining during the Second World War. Â Continue the trip to the â€œPan de Azucarâ€� valley, where you can observe typicals plants & landscapes of the region. Stop in â€œLos Chorreonesâ€� to cool off in the river. Lunch at â€œRuinas del Cafetal el Carmeloâ€�. The trip continue through the valley back to the hotel. 06:00 pm Return the jeeps to the hotel. Afternoon & evening to explore or relax, as you like. Relaxing or diving on a classic, idyllic, tropical desert island. Night at hotel Cayo Levisa . Also included: Transfer & Ferry. 08:30 am Journey by bus from Jazmines Hotel to Palma Rubia (50 km - 1 hour) to take a ferry to Cayo Levisa, small island off the northern coast of Pinar del Rio province, where you can enjoy of a relaxing and quiet stay. Â Free day to enjoy sunbathing, snorkeling, sipping a cocktail on one of Cubaâ€™s most beautiful white sand beaches. We highly recommend diving in Cayo Levisa, with 21 dive sites along the coral reefs. Also the Cayo Levisa Diving Centre offers several courses, so you can have the SSI certificate. They have 3 departures every day at 8:30am, 11:30am & 2:00pm. You can book & pay it locally. Soroa, the Rainbow of Cuba. Night at hotel Soroa. Also included: Transfer & Cubaism support rep all day. 09:00 am Take the ferry to go to Palma Rubia (40 min). 10:00 am Journey by bus to Soroa (75 Km - 1.5 hours), where you are free to visit the Orchid Garden and take a bath in the famous waterfall. On the highest hill of Soroa you can have an ice cold drink, in the â€œCastillo de las Nuvesâ€� (â€œThe Castle in the Cloudsâ€�) bar. Also you can swim in Soroaâ€™s Hotel pool. Car Exhibition. Night at All Inclusive - hotel Breezes Jibacoa . 09:00 am Journey by bus from Soroa to Havana (88 km - 1 hour) to join with â€œAutos Rusosâ€� club to delight a car & motorbike driving exhibitions & contests. 02:00 pm Journey to Jibacoa (80 km - 1 hour). 04:00 pm Check in at hotel Breezes Jibacoa. Matanzas, City ​​of Bridges. Night at hotel Velasco . Morning at the all inclusive Jibacoa Hotel, pool & beach. 12:30 pm Lunch at the hotel buffet restaurant. 02:00 pm Journey by our bus to Matanzas City* (41 km - 1 hour). Afternoon & evening to explore the beautiful city. *Matanzas: Matanzas is called the City of Bridges, for the seventeen bridges that cross the three rivers that traverse the city (Rio Yumuri, San Juan, and Canimar). It was also called "La Atenas de Cuba". Matanzas is also the birthplace of the Cuban national dance "The Danzon" and of the "Danzonete"; it was and still is a prominent rumba dancing place, and the home town of numerous artists, composers, and intellectuals, who are responsible for the city's traditionally intense, thriving cultural life. The main tourist places are Parque de la Libertad and Museo Farmaseutico (Both in front of Hotel Velasco). Motorbike Event. Night at All Inclusive - hotel Blau Marina Varadero. 10:00 am Vintage motorcycles event at H. Velasco. Join with Club L.A.M.A (Latin American Motorcycle Association) and their really nice old bikes for coffee & photos session. Donâ€™t forget to have your camera battery fully charged!! 12:30 pm Journey to Varadero. 01:30 pm Check-in at the all inclusive at H. Blau Marina Varadero. Lunch at the buffet restaurant. Afternoon & evening to relax on Varadero beach..
Also included: Transfer & Cubaism support rep all day & flight. Morning to relax & enjoy the all inclusive service in Blau Marina Hotel, Varadero beach. 12:00 pm Lunch at Blau Marina Varadero buffet restaurant. 04:30 pm Arrive to Havana Airport. Check in. 07:30 pm Flight to London (Gatwick). 09:15 am Arrival in London (the next day, local time). Please fill in the enquiry form below and we will contact you back (during office hours). ©2007 - 2019, Nigel Hunt - All Rights Reserved.